Have you recently taken the plunge and purchased a standing desk? If so, you may now find yourself looking for a way to reduce fatigue and soreness in your feet. This is a common problem for proponents of standing desks, but one that can be easily remedied with a balance board. The best balance board for a standing desk is the one that fits your body size, budget and balancing abilities. Balance boards come in various forms, but the two most common are the rocker board and the wobble board. Both of these options require you to engage your core muscles to maintain your balance. 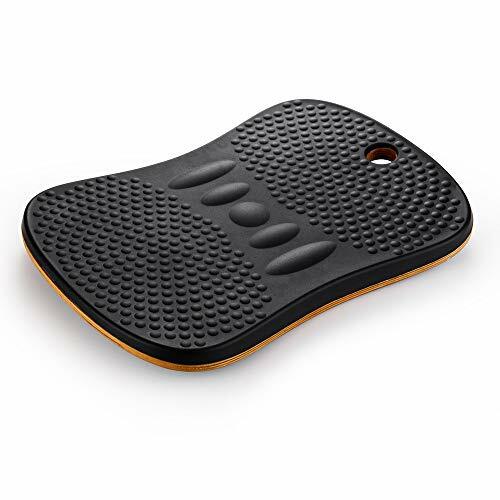 Balance boards can be used under desks, in conjunction with physical therapy, and even while doing household tasks such as washing dishes, folding laundry or even watching television. Introducing stability training to your daily regimen has been proven to help the body in numerous ways. When used in conjunction with a standing desk, they can help ensure you don’t get sleepy around midday like many people are prone to do. If you’re searching for a low-impact way to lose some weight, the combination of your standing desk and a balancing board is a good start. Balance boards increase your functional strength, which is the strength required by your body to perform everyday activities such as taking out the trash, walking the dog, playing with your children, and getting through your workday. When your body’s functional strength is increased, the likelihood you’ll suffer from an injury or fall is lessened. Balance (or stability) training helps build muscle tissue which strengthens your core, back, glute, and leg muscles. These areas support your body in the performance of its daily activities. Not only that, but your equilibrium improves and you’re less likely to lose your balance and fall. This is particularly true for senior citizens. Poor posture is a common problem among office workers. It may be one of the primary reasons you chose to purchase a standing desk. When your body is affected by muscle imbalance, and you carry excess fatty tissue, sitting for long periods encourages poor posture. By using a balance board, you strengthen your core, back, and shoulders. This action ultimately corrects your posture, resulting in less back, neck, and joint pain. Another common problem many office workers face is unwanted (and unpleasant) back pain. Increasing your core body strength not only improves your posture but helps reduce lower back pain. Stronger abdominal muscles mean your back muscles don’t have to work as hard to support your body. When your back muscles aren’t as strong as they should be, they will tighten up, and your spine may become misaligned. A lack of coordination isn’t just something young children experience. Adults who spend too much time seated are more likely to have improper balance throughout their entire lives, leading to a greater risk of injury. To stay centered and upright, all of your body’s muscles must work together in harmony. Using a balancing board will improve your coordination and body position awareness. When choosing a balance board that’s right for your body, consider the type of board, the size of the deck, the design, and your budget. There are various types of boards, but the most commonly used with standing desks are the rocker and wobble boards. Both of these offer functional and aesthetically pleasing designs that fit any budget. Rocker boards offer two planes of instability, but you’ll only use one at a time. You can rock side to side or back and forth. These boards feature a semi-circular base and a square deck that usually measures less than 20 inches by 20 inches. These boards are good starter boards for people who aren’t quite ready for the full balancing board experience. 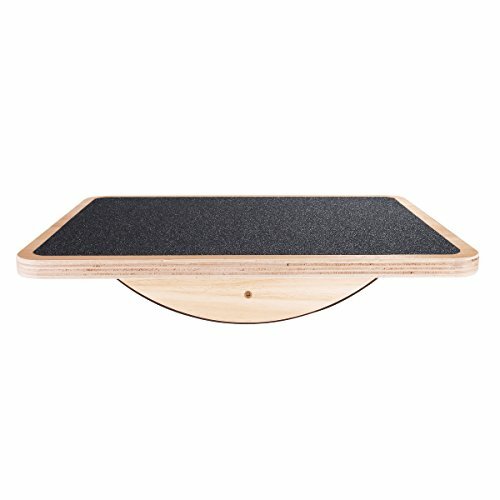 Wobble boards provide more freedom of movement, giving you a 360-degree tilt. These boards often have removable, ball-shaped bases, allowing you to switch between a rocker and wobble base. Decks vary between 15 to 20 inches. Some of these boards will have a tilt angle as high as 20 degrees, which provides an excellent workout for your knees, calves and core muscles. The following options provide a wide range of choices for both rocker and wobble board styles. These boards are all reasonably priced and vary depending on the brand and design. Regardless of their style, each one provides the health benefits described above. Live Balanced – Easy lateral motion Balance Board challenges the Core, not the Mind. Boost Productivity – Increase Focus & Clarity with a Standing Desk balance board that’s adjustable. Improve Posture – Strengthen Core Muscles & Decrease Back Pain with simple movement. 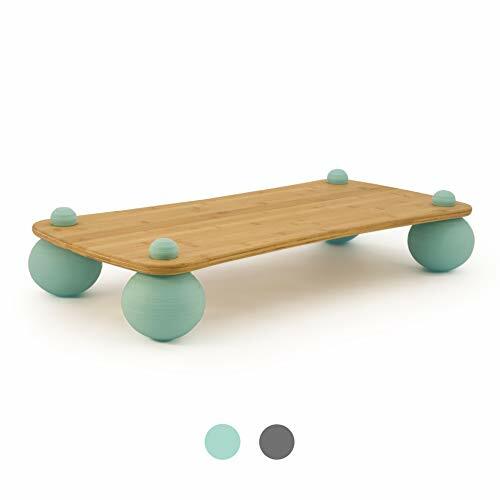 The Pono Ola is a balance board that challenges “the Core, not the Mind.” This moderately-priced model is designed to minimize the see-saw or teeter-totter effects you feel with other styles. The Pono Ola is a rocker-style board. The StrongTek balance board stimulates your core and improves your agility, reaction time and stamina. All of this is achieved through low-impact exercise. This board is the lowest-priced model of the five reviewed here. Weight limit of 320 lbs. This mid-priced balance board offers subtle motion movements to keep your body and mind engaged. This has been proven to increase productivity in an office environment. The Gaiam balance board is a less-costly alternative to standing desk treadmills. 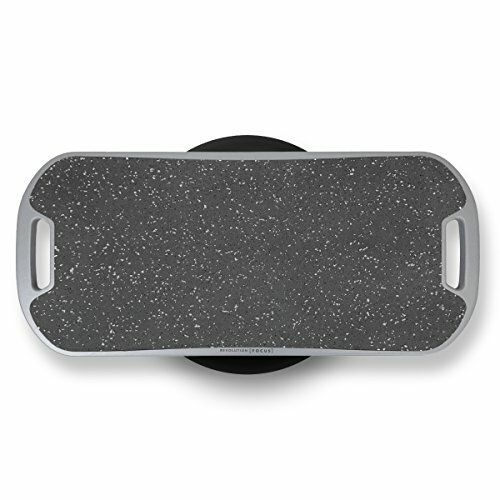 The Revolution Focus is a wobble style board with a 2-piece design. It challenges and engages the entire body by enhancing physical activity while you work at your standing desk. This board is the highest-priced model of the five reviewed here. Balance boards are an excellent complement to a standing desk. Not only do they keep your feet moving, but they promote increased core strength, better balance, and improved circulation. The benefits of adding a balance board to your collection of ergonomic office furniture far outweigh the minimal cost you’ll incur to do so. When choosing a board, be sure to consider all of the options and weigh the pros and cons of each model. Because these boards are offered in more than one design, you’ll need to consider which is best for your body. Once you choose a board, stick with it. It won’t be long before you notice a marked improvement in your balance and core strength.